A few months ago I came across Zenergize Vitamin Boost tablets at my local Whole Foods. They were a bit expensive (about $8 for a box of 10 tablets), but I decided to try them anyway since I figured they might taste good, and they might help me drink more water (and even get more vitamins) during the day. I have to say, they beat my expectations! At only 2 calories per tablet (0 weight watchers points goes without saying), with 0 g sugar, and all natural ingredients, they have a lot going for them! On top of that, what is really nice about these tablets is how potent they are. One tablet adds almost too much flavor to a cup of water, so I usually put one tablet in two cups of water instead. Also, I love the fizziness that they add to my water. My favorite flavor is Fruit Punch (which ironically is called Men's multi-vitamin boost -- I figure that is just marketing and I drink it anyway). I always loved the taste of fruit punch, and this Zenergize flavor reminds me a lot of the fruit punch I drank as a kid! 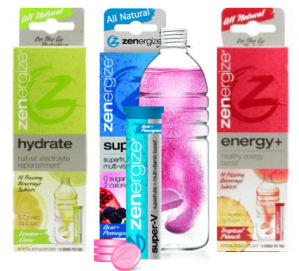 The Zenergize tablets come in many other flavors and vitamin combinations as well, including but not limited to: berry blend (energy+), tropical punch (energy+), citrus (immunity), orange and pomegranate (thrive), peach and green tea (burn), lemon lime (hydrating), and tropical (chill). Some of the flavors contain caffeine, so make sure you read the label carefully, if you are trying to avoid it. You can buy Zenergize at Whole Foods (in the vitamin section) or from Amazon (a little cheaper but with a shipping cost). By the way, for people interested in water substitutes, I wanted to call attention to two previous blog postings I've done on this topic: (1) my favorite sweet tea, and (2) a posting about how to make your own fruity water at home. Having yummy drinks around is really important since sometimes thirst presents itself as hunger. Enjoy your low calorie flavored water! Thanks for sharing! I just tried their Super-V which was yummy!! Yay. I'm so glad you like them too! I suugest trying the Immunity Orange Pomegranate. The flavor is rich and the Vitamin C content is 1500mg. I travel a lot and take this wherever I go for a boost to my immune system!